Stick It To The Man by Zoink! promises to be an intriguing release when it arrives on the Wii U eShop in Spring. After previously arriving on PS3, PS Vita and PC, its arrival on the Wii U will make use of the GamePad to enhance the mind-reading mechanic, with Zoink! founder Klaus Lyngeled referring to the upcoming release as the "gold version". That should naturally please Wii U owners, and this is an experience that could be relatively unique on the system. 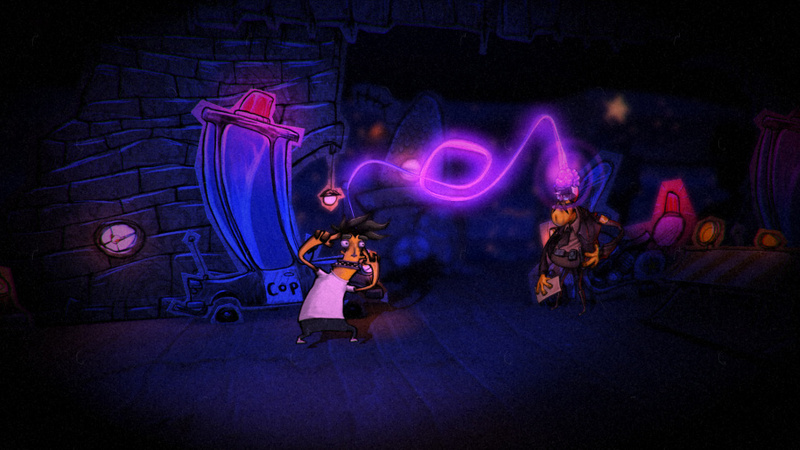 With elements and ideas from point-and-click adventures combined with some platforming and style, this is a genre-bending experience with a unique sense of style. While we're yet to see how well it all comes together in the upcoming release, we can be sure that it won't be a dull experience. Shortly before its official announcement last week we had a conference call with Lyngeled and Ripstone's co-founder Phil Gaskell to chat about the game, the Wii U difference and to learn a little more about Zoink! itself; it's a studio with a particularly diverse background that helps provide context to the off-the-wall approach of Stick It To The Man. We cover a number of topics, so you can check out the full interview below. To start with Klaus, can you give is some background on your development history to date? Lyngeled: My name is Klaus Lyngeled. I live in Sweden and run Zoink, and today we have 14 people. We've had a little bit more since doing Stick It To The Man, but we'll usually do two projects at the same time; so something that's our own indie game and then some work-for-hire at the same time. I've been working with games for a really long time, I guess almost 15 years. Started out with Amiga, working for different companies like Shine Entertainment in America, and then came back to Sweden and started Zoink. We've been doing a lot of things with the company, beginning with just me trying to sell game ideas, then I did comic books for a while, made short animations, commercials, commercial animations. Then I was back into doing games again and in the last couple of years we've hired more people because we started projects like Stick It To The Man. Lyngeled: Not really, actually. One of the first games we did was The Kore Gang. But it was done on the original Xbox, was cancelled for six years and we managed to pick it up and get it going again. It finished up on the Wii but I don't think it was as good as it could have been. But yeah, the last couple of years when there was a big surge for iOS and Android games then we started working on the that. It was our chance to start and release some of our own games quicker and easier. We will get to Stick It To The Man shortly, but we've got to ask about WeeWaa plush toy game for Wii. That seems like a fascinating project. Lyngeled: WeeWaa was an idea I came up with when I was playing around with the Wiimote, I thought it'd be funny to do some kind of puppeteer game. Then I realised, why don't we just put the controller inside a plush toy? So we started on that, I was trying for a Nordic game grant which I won with the idea, so we did a prototype of the game and managed to sell it to Majesco in America. We pretty much had the whole game finished in the end, and we were submitting to Nintendo but they had to cancel at the end as they saw the Wii market was collapsing, basically. Would that have been 2009/2010? Lyngeled: Yep. That was too bad. We actually did think about whether we should release it for Wii U, run a Kickstarter for it which would be kind of funny. You can ask Ripstone to publish it and you'll be set? To focus on Stick It To The Man, can you tell us about the start of the idea and early process of bringing that to PS3 and Vita? Lyngeled: It's a combination of different things. We're always thinking about stuff you can do, something we'd like to do in real life but can't. We were talking about an art project where you could just sit on a bus and read people's minds, see what they're thinking about. That turned into questions of whether we could make that into a game, could that be turned into an adventure game; we didn't want to do a full point-and-click adventure game. Then, when I did The Kore Gang we had a lot of voice acting, and it was actually quite cheap and really fun to work with, I really enjoyed that. Also when we did the short animations it was really fun to do just voice directing. But it was so expensive to do all the animations for each character, so we thought if you just mind-read somebody we don't need to animate them but you can still get something from them. So that's kind of where the idea came from. Then I did this short animation test where I had these paper cut-out characters, that looked really cool. We posted that on our blog last week, so you can see the original short animations there. And then we just tried to get that style together in a game, basically. Quite early on we did a trailer of the game, or really just a story trailer, so there wasn't much gameplay in there just basically the story. We were trying to put that together to publishers for almost two years, I think? Then once Ripstone... well, it took a while, after we'd been talking for six months it then went really quick. The development time was very short, probably 10-11 months development time. An eye-catching feature is that visual style. Did you already have custom tools to produce that quickly and easily? Lyngeled: Not really, it was tried out in that short animation. It's like a classic 3D mesh character, but flat. There's no real tools it's just the animation style, like how we cut the head in two pieces. We call it Deluxe South Park. It was also the plan to figure out a way to do something cheap, in a way? Looks good but doesn't take a lot of time to animate. We use classic tools including Unity, nothing special. Did it feel like a gamble, or diversion from the norm, to produce an adventure / platformer; it's not a style you necessarily see often on consoles, perhaps? Did you think that was the case, were you targeting a niche? Lyngeled: I don't know, I didn't think about it that much. I just did something I thought looked cool! It wasn't that thought through, we just thought it looked really good and we thought we'd like it. If you look at a lot of short animations, cartoons and comic books, we don't feel like this is that weird looking or different. In a game environment, from that side of it then, of course, it looks a little strange. For me this is kind of looking normal (laughs). So you were able to combine all of your previous work and skills, essentially, with this? Lyngeled: Yeah, exactly. I think that's why it worked really well. It's a bit of short movie, a bit of comic books, it's the way I draw with character designs, the way it works together. I kind of have a big bug-bear about games and the games industry at the moment — they're just not funny. We tend to take ourselves too seriously, we do shooting and army men really well, but there are so many forms of entertainment. Were you the primary writer? Lyngeled: The story is written with Andreas Beijer, my sidekick here, so we write the story and some of the puzzles. But then we have Ryan North. He's the writer of the Adventure Time comic books, so he takes our script and he adds in parallel to them. So we'll say "here's this character that wants to do this, his wife has left him and this is going to happen", and then he basically adds the dialogue to it. His work is amazing, he really did something totally special to the game that we couldn't have done ourselves. So that was a really good fit. I did work together with Ryan North on a project before, we did an Android game for Cartoon Network. That's how we got to meet, became friends and I thought this would fit perfectly for him; he teamed up with us and it was good. To bring Phil in here, what was it about Stick It To The Man that prompted Ripstone to step in and publish. Did you feel there was a particular market, or was it just a case of liking the game and that was it? Gaskell: It starts off with just liking the game, and thinking "is this a game I want to get involved with, can I contribute in a way that would improve the game". I kind of have a big bug-bear about games and the games industry at the moment — they're just not funny. We tend to take ourselves too seriously, we do shooting and army men really well, but there are so many forms of entertainment. We love The Last of Us and Beyond because we're going down thrillers and dramas — there are so many other genres in TV and film, the rom-coms and, you know, comedies. We as an industry, the games industry, don't seem to try and investigate. One of my all-time favourite games was Conkers' Bad Fur Day, just because it was funny from start to finish, and when I first saw the trailer for Stick It, it made me laugh. Instantly I wanted to get involved, it's a funny game, and I wanted Ripstone to be part of it. It really helped having striking visuals, as well, to help it stand out. We chatted at length with Klaus about how we could get involved. Ripstone's not a big, corporate publisher, we don't have wads of cash falling out of our pockets, so we have to be careful what we get involved in; we're quite a boutique, indie-friendly publisher. So that's why it took us a little while to work out how we can structure Ripstone so we can afford to fund and get involved in this game. It started off by making me laugh, nice and simple. 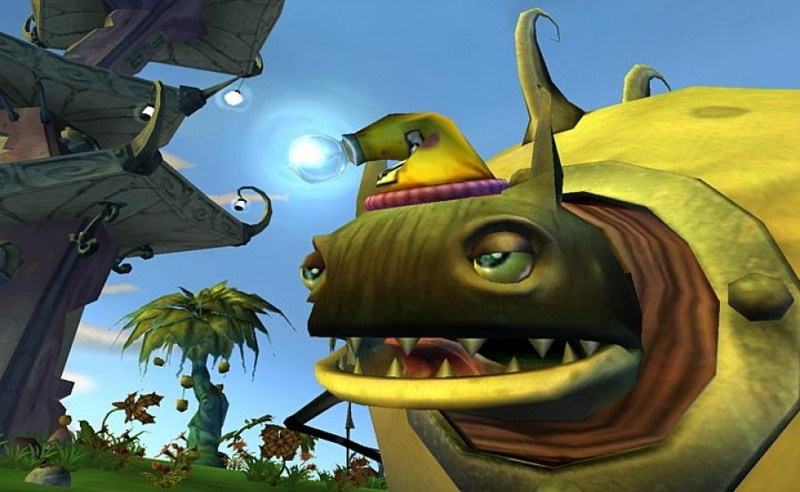 Does it feel like a throwback to the '90s adventure games that were basically comedies? Monkey Island and the general work of LucasArts, for example. Were they an inspiration or is it just a coincidental return to that style? Lyngeled: I think it is for me. Unintentionally I guess it is, it's not like I was sitting there thinking about that, but I do really like Monkey Island, one of my first big game experiences. I do like Broken Age, which has just come out, but there is something about those older ones where there's a bit more edge, if you know what I mean? In a different way, more ugly. I used to love Day of the Tentacle, for example which was quite... on the nose. Gaskell: They were think 'em ups, right? It wasn't twitch gaming, short attention span stuff. It was "I'm going to sit here for 3-4 hours and think how the crap do I get past this one puzzle", we were so much more patient as gamers in those days. 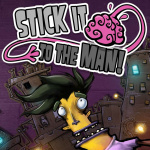 Stick It To The Man also has elements of platforming and stealth, of sorts. So it's a hybrid, it's fair to say, of platforming trends so popular with download games in particular? Lyngeled: I don't like when you do get stuck and have nothing to do. I do like that you have full control of the character, you can feel you are him instead of just ordering him to "go there", click and wait for him to do it. It was a gamble to see if that actually worked, and there are some people that don't like it; mostly people say it works out really well. I do think it works really well, and I was also scared there'd be too much running around. That's a problem with The Cave, for example, where you have to do a lot backtracking. I haven't had that problem with Stick It To The Man, it doesn't feel the same way as it did in The Cave. I thought the stealth thing was just funny and fit the character. For a while we had it that you could slap the enemies, but we took that out because we didn't think it would fit with the character. He's much more of a scared character that doesn't do attacks, he's not a hero. He'd just run! I think that really helped the game to make it like that. At what stage did you decide to bring Stick It To The Man to Wii U? Was that a fairly recent decision or longer term? Gaskell: Because the game's built in Unity there's an easy commercial decision to be made, because Unity's free to use on Wii U, there are no charges. So, just from a pure commercial angle it makes a lot of sense for a small outlay to put the game onto Wii U. From a creative point of view I think the Wii U offers Klaus an opportunity to do something different with the experience using the GamePad, using the things that are unique about the Wii U. It let them be more creative than if it was ported to a regular console system that doesn't have those platform features. I think it's a great move that they supported Unity, especially for us. For us it's easy to make sure we also, if we do more games, we'll also release on Wii U, it's no problem. In terms of the port itself, has it been your core team working on this version, or have you been consulting with a third-party that's been doing the work? Lyngeled: That's the cool thing about using Unity, I guess. Our lead programmer does all the different versions himself, it's exactly the same guy... he's sitting right next to me! That's how we could do these new features. I think it's a better version than the PS3 version, to be honest with you. I don't just say that because you're from Nintendo Life! I do think the features are so nice, I think it's really fun to play with. We also had time to go through and tweak a few extra things that we didn't have time to fix on the PS3 version. We had more polish time, increased some of the textures to make them a bit better, it works really well. It's a really good version. Do you think your experience on iOS and Android also help with the Wii U, as a hybrid that has a touch screen but also sticks? It mixes and matches various options. K: Maybe a little bit, yeah. 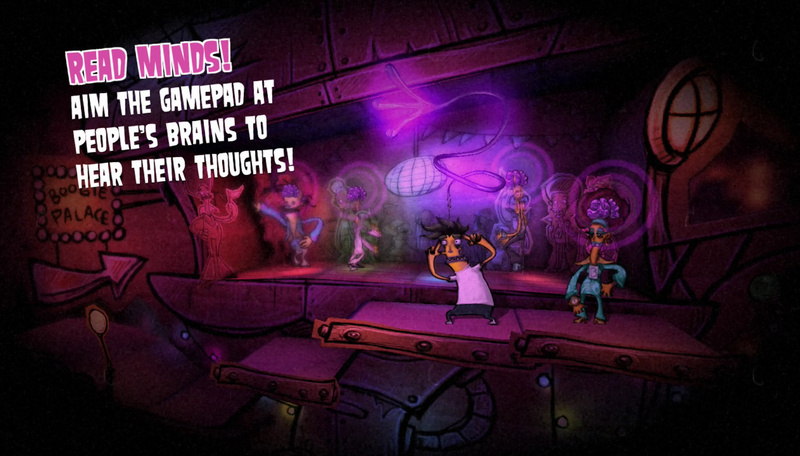 We did do the PS Vita version as well, which had touch controls as well. We've gone through all these different versions, and the good thing about doing the Wii U version at the end is that you learn more from the different versions and improve them. It's like you get the Gold version. I think the most important thing is that you can use that mind-reading device and that it's more polished, basically. Has it been a relatively smooth process using the tools and Wii U hardware? Lyngeled: I think it was easy to get it up and running, but the hard part was actually to get the game design of the GamePad feeling good; that took longer than we expected. Technically, it was quite easy. Are you quite confident in the Wii U eShop as a platform, is there a good audience there that'll be interested in this game? Gaskell: I think there is, yeah. We all know that the install base has been disappointing compared to other contemporary consoles and even smart phones but, we've all learnt over the years never ever to write Nintendo off, as a hardware manufacturer. They had a similar trajectory on 3DS in the early days and turned that around immensely, with a userbase close to 45-50 million units. What you can always pretty much bank on with a Nintendo device is that they've got a very loyal following, of gamers. I think this game will really appeal to those people. Lyngeled: I'll tell you what's funny, I even had Nintendo calling us up from their office in Germany to say they'd played through Stick It To The Man and really enjoyed it; that was pretty fun. They actually play the games, which is a weird thing. It shouldn't be weird, but it's a shame it is. You've now had a bit of experience with Wii U, Klaus, is it a platform you'd be interested in exploring in future? Or are there any other road-blocks or concerns for that? Lyngeled: I really like it. I think it's a great move that they supported Unity, especially for us. For us it's easy to make sure we also, if we do more games, we'll also release on Wii U, it's no problem. It'll just be fun. I just hope it will sell more, but I'm really looking forward to the new titles they're releasing soon, Mario Kart, that's going to make a big difference for the Wii U. But for the future sure, it was fun to do this one, we'd like to do more on Wii U. So you're fans of the system but do you think, as a personal opinion, that upcoming games like Mario Kart and Smash Bros. will turn it around? Lyngeled: I think it could, yeah. It's interesting a lot of people here aren't far away, they are a fan of Nintendo. About six guys here have a 3DS and they sit and play together, it's kind of unusual, you know? My son always wants to come to work here so he can get more StreetPass hits! I think we really like the system, and we've grown up with Nintendo titles and love them. I do really want to see the Wii U succeed, and I do think some of these titles like a new Zelda will really turn the thing around for me, at least. To finish up with Stick It To The Man, for those unfamiliar it's primarily a good-old single player adventure game, right? No online aspects? Lyngeled: It's a good-old single player adventure game! It's not exactly a crowded market for that kind of game. Lyngeled: It is a hybrid. So it's a platforming adventure game. We don't want to disappoint adventure people either, but there is platforming in there! I have people complaining about that. "What? There's platforming in this game? I don't want to play it". You can never please everyone! Lyngeled: It's a new experience. Gaskell: Stay tuned. Coming to an eShop near you soon! We'd like to thank Klaus Lyngeled and Phil Gaskell for their time, as well as Ripstone's Michelle Senior and Ami Langton for arranging the interview. I like the idea of indies making use of the gamepad. It just seems like a good fit for many of the types of games that come from that sector of devs. It is too bad that now in the second year of Wii U we still have to talk about the installed base as a disappointment even amongst the Indie community and still no idea if it will ever have its '3DS moment' like we had all hoped last fall. True story, that WiiWaa trailer was the first time I heard the song "Dance" by Justice. So we are not getting a gimped version, we are getting the gold version? You gotta love indies. I will be supporting this. I almost picked this up on ps3. Glad I didn't. I will get this for Wii U for sure. The more I read about indies and Gameboy VC on the Wii U - and hardly any retail titles until May 30* - the more I think Nintendo could use a PS+ type service for the Wii U. Though maybe less like PS+ w/ it's themes and avatars and more like a Gamefly or Netflix monthly rental service. They're already halfway there w/ the sales they've been having - which I've been impressed with - I've purchased Toki Tori 2+, Trine 2, Kung Fu Rabbit, and Spin the Bottle - all on sale. And they've had MH3U and Zombie U and other retail games on sale as well but I don't usually purchase retail games digitally. The limited storage space on the Wii U makes a rental service a good idea - download something, play it, delete it, download something else. That's everything, 1st, 2nd and 3rd party. And I'm not holding my breath for B2 on May 1 or W_D June 30th. So it's an indie and VC machine for the next few months, might as well advertise it as such w/ an exclusive rental service. Good thing I haven't already bought this game. I'm excited for this game. Pretty sure I'll get it.